From East Howle, Ferryhill, served with 18th Battalion DLI (Durham Pals). Thomas Stratford joined the 18th Battalion Durham Light Infantry (DLI) on 25 September 1914 at their training camp at Cocken Hall. His previous experience in the Volunteer Battalion of the DLI must have stood him in good stead as he was promoted to acting lance-corporal a month after joining up. Three months later he was promoted again, this time to acting corporal. In March 1915, Stratford was elevated to acting lance-sergeant and finally received the full rank of corporal in December 1915. 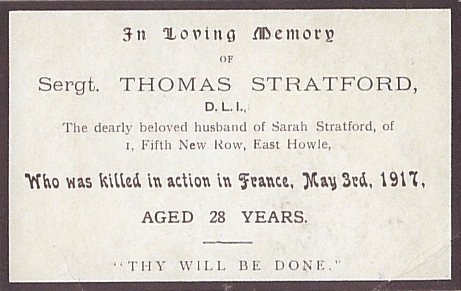 Thomas Stratford was killed in action on 3 May 1917 in France.